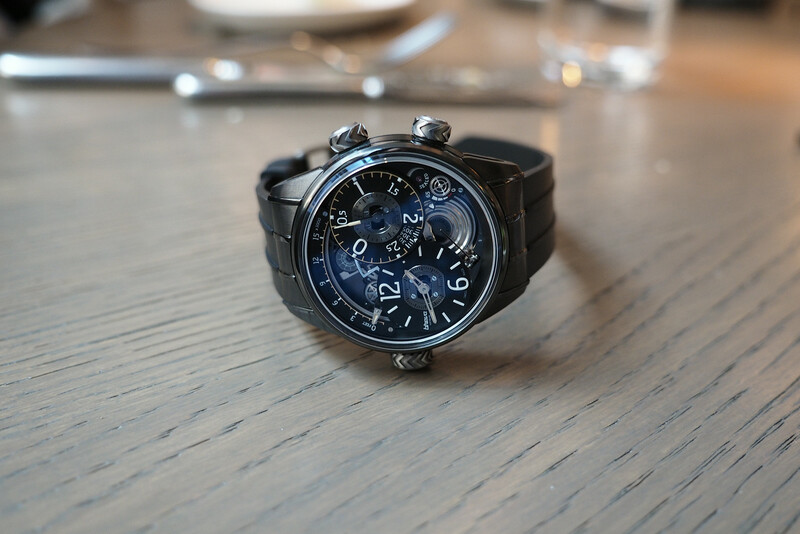 We recently got a hands-on look at the latest watch to come from Geneva-based Breva – the Génie 02 Air Altimeter. It features a beautifully finished Jean-François Mojon/Chronode movement and is equipped with a high-performance mechanical altimeter. For the first time, Breva is offering a black case. Consisting of 88 total components, the case is in grade 5 titanium with a black PVD coating. 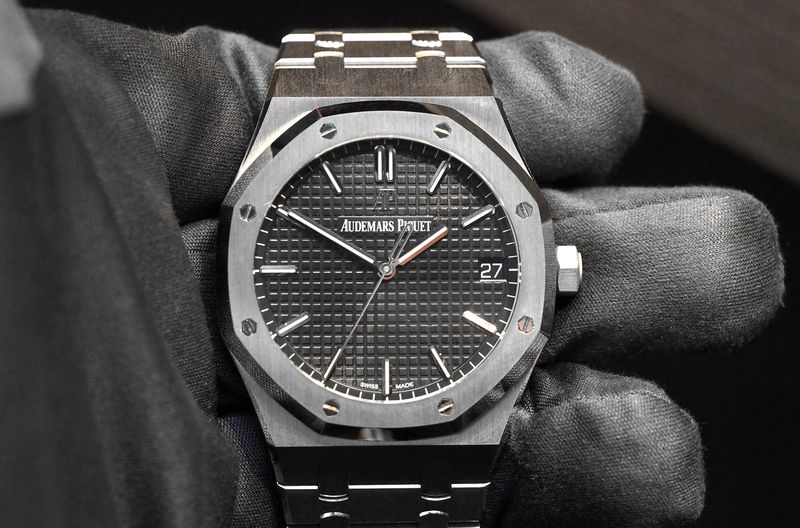 It measures 44.70 x 16.10 mm, and while it is not small, it is a very comfortable and it does not look huge on the wrist. The steel crowns and polished accents give the watch a unique, sporty two-tone look. Personally, it is my favorite of the Breva watches to-date, both visually and functionally. In addition to the time, which is displayed on the off-center dial located between 6 and 9 ‘clock, the watch is primarily focused around the altimeter. Accordingly, the altitude reading is prominently displayed between 9 to 1 o’clock on the dial via an arc-shaped display that goes from zero up to 16,400 feet (or up to 5,000 meters if you opt for the metric display). 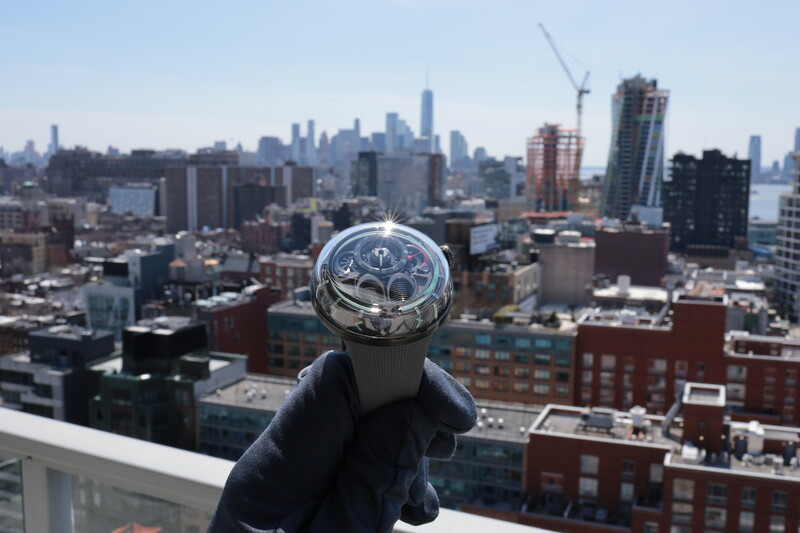 Underneath the altimeter display is a continuously rotating small seconds disc, which is printed with a (non-functional) compass rose, a signature of the brand. The valve safety indication, that tells you if the air valve is “SEALED” or not, is at 4 o’clock, and reads red when open and white when safely sealed. Just below this is a power reserve indication. To compensate for weather or temperature induced barometric pressure variation, the altimeter needs to be calibrated by using a known altitude or pressure value (a specific landmark can be used). If a known altitude is not available, a known pressure value will suffice. Using the crown at 2 o’clock, the calibration can be adjusted, in conjunction with the dial at 2 o’clock. Three chevron-engraved crowns wind, set, adjust, and operate the functions of the Génie 02. At 9 o’clock a two position crown sets the time and winds the movement. The crown at 2 o’clock screws down and operates the altimeter’s precision-scale and the large scale to adjust for variations in air pressure (this affects the altitude readings). At 4 o’clock is another screw down crown which either seals air out of the movement or allows it in (for altitude function). Longevity and reliability of the timepiece are maximized by means of an osmotic Teflon membrane that filters any moisture and humidity from air before it enters the movement. Just above the crown, a white band on the dial marked “SEALED” warns when the valve is unlocked. The dial and caseback are protected by sapphire crystals (a domed crystal on the front and flat crystal on the rear) that have been treated with an anti-reflective coating on both sides. The black grained dials with galvanized nickel silver indexes and numbers are set above the open-worked elements of the movement, giving the watch a three-dimensional look. 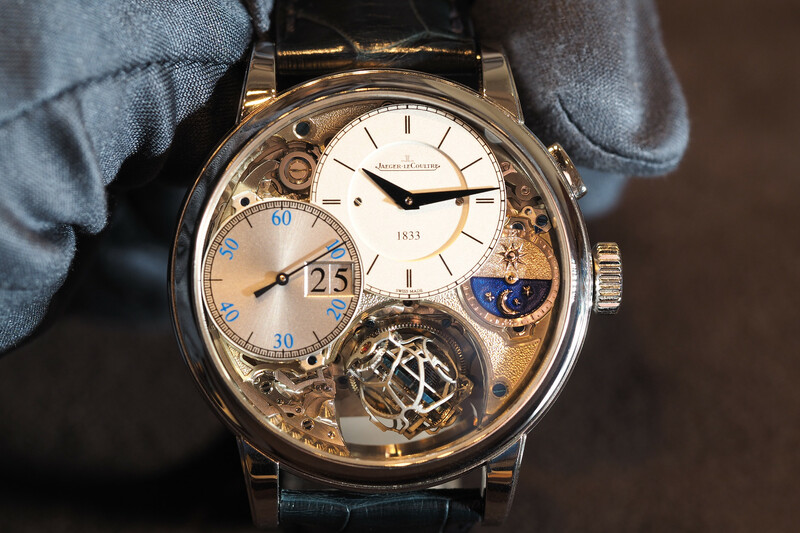 The proprietary movement which was developed exclusively for Breva by Jean-François Mojon/Chronode beats at 4Hz, has 415 total components, 45 of which are jewels and a 65-hour power reserve. According to Breva, “The aneroid capsules in the Génie 02 were especially developed to Breva’s specifications to optimize their precision and use in a wristwatch. The capsules are made from a special non-magnetic memory metal (a Breva-patented invention), which is lighter and stronger than aluminum and has twice the ductility of steel. The capsules are exposed for long durations to high temperature and pure oxygen to maximize thermal conductivity and oxidation resistance. The Génie 02’s aneroid capsules were developed specifically for registering air pressure for altitude readings rather than barometric pressure, and are different from those used on the Génie 01. A nice detail on the caseback, is that the perimeter of the is engraved with the code names of many of the world’s airports, along with their altitudes above sea level: GVA−430M¬, HND−6M¬; SYD−9M¬; JFK/LHR−24M; SIN−7M; DXB−19M; HKG−9M; LAX−38M; GYD−3M; CDG−119M; BCT−4M; CVF−2008M¬; OLB−37M; IBZ−6M; MIA−2M¬; KUL−22M¬; LTT−18M¬; CGK−10M¬¬; BGI−52M. The Breva Génie 02 Air Altimeter comes with a soft natural rubber strap and a black PVD titanium pin and buckle. Water-resistance is 30 meters. The price is $132,000 and it is limited to 55 pieces.